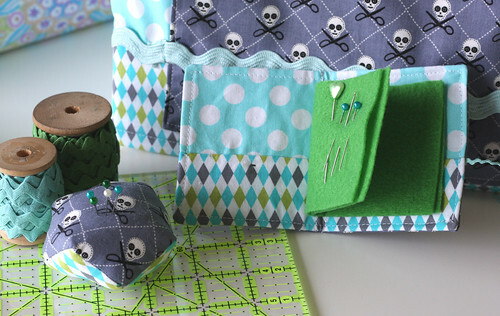 Welcome to Week 12 of the One Yard Wonders Sew Along! 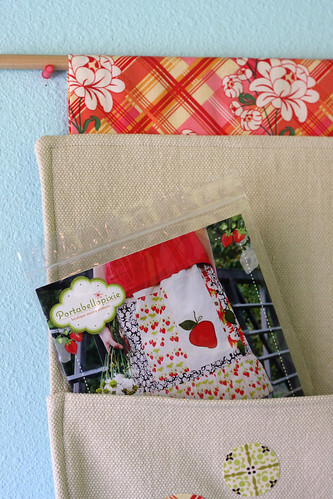 Carrie chose Moda Fabrics Sahara Cloth Linen and various fabrics from her stash including prints from Sandi Henderson Meadowsweet. Fun project with easy to follow instructions. Be sure to print the correction on the cutting layout. The main body placement lines are represented as cut lines in the book. Carrie did not have a Grommet Kit so she decided to attach a rod pocket at the top. She cut the piece of fabric 6″x 13″. On the short sides fold in and press the fabric 1″ then fold length wise with wrong sides together and press. To attach the pocket, line the raw edges up with the top of the main body and stitch 1/4 from top. In step 5, Stitch the Main Body, you will attach the remaining main body piece with a 1/2 inch seam allowance which will cover 1/4 inch pocket stitching. After turning and pressing the fabric Carrie had a difficult time top stitching through the thick layers with her machine. Thankfully, Kathy saved the day by taking it home to do the top stitching with her walking foot. We all agree a walking foot is a must have. The embellishment was done by tracing circles on wonder under and cutting them out. 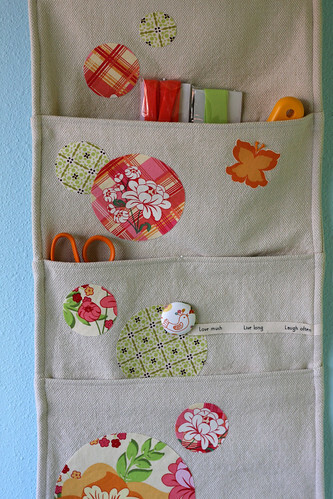 Iron them to fun print fabrics, arrange on the hanging wall pocket and iron on. Printed ribbon was used in place of stamping. 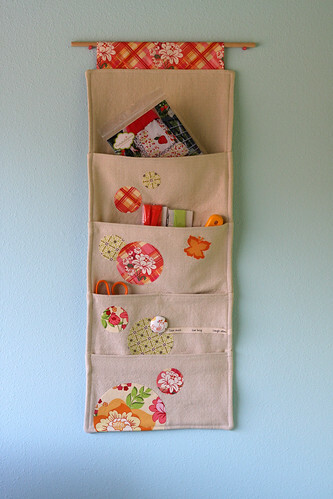 The wall pocket will be a fabulous addition to Carrie’s daughters college dorm room. A second Hanging Wall Pocket is a must for the kitchen. 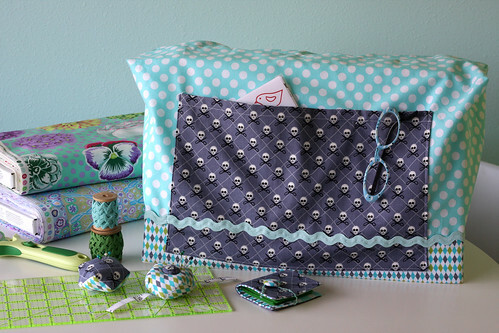 Diana selected 3 fabrics (she can’t resist) Michael Miller Ta Dot Ocean ,Michael Miller Mini Harlequin Lagoon, Michael Miller Quilt Pirates Gray. The Sewing Machine Cover was easy peesy. A very quick sewing project. Measure your sewing machine cover and adjust accordingly. Diana’s was significantly wider. Depending on how large you machine is you may need more than a yard of fabric. 3/4 of a yard of the Ta Dot fabric was used for the machine cover. 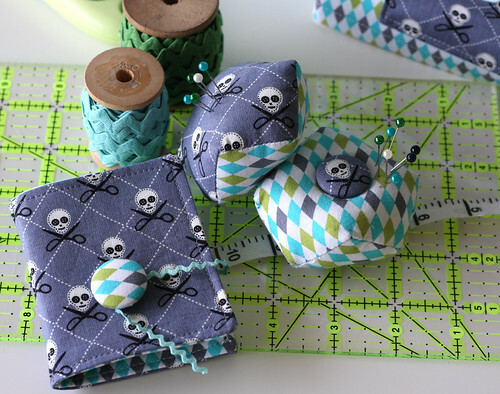 1/2 yard of the Quilt Pirates for the pocket and accessories. 1/4 yard of the Mini Harlequin for the border and accessories. The Needle Cover instructions were super straight forward and easy to follow. She can’t resist multiple fabrics. Carrie helped by making a covered button for the closure which made it super cute! The interior called for a 5 1/2 inch square of felt to be cut down to size. Diana missed that step so the needle cover has more felt pages for needles. Diana recommends taking the instructions for the Pin Cushion one line at a time. Break it down. Do exactly as instructed. It will work. When you start, lay the squares on top of each other matching point A on square A with point B on square B. Everything else will make sense as your sewing. Again, trust the instructions, it will work. The Pin Cushion was more challenging than expected. What a feeling of accomplishment when completed. It looks soooo amazing! The second Pin Cushion (without the strap) was made with contrasting fabrics to accent the zigzag stitch line. Super easy and even more fun the second time!